Tampa area historic resources – Page 18 – TAMPA PRESERVATION, INC. 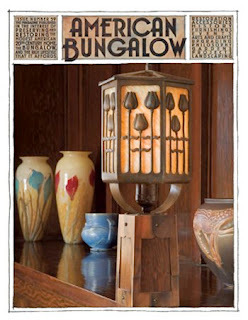 In the spring of 2007, the prestigious architectural publication, American Bungalow, sent their chief photographer, Alex Vertikoff to Seminole Heights to photograph their beautiful bungalows for inclusion in the magazine. Alex, who has photographed hundreds of houses all over the country, was amazed by the wide variety of bungalow styles he found, and thrilled to play a part in revealing the charm of the neighborhood to the magazine’s vast, international audience. The story of Seminole Heights early years as a trolley car suburb, its heartbreaking decline and vibrant renaissance will appear in the winter issue, to be distributed in November. Future editions will feature Hyde Park and Ybor City. Purchase your copy from Sherry’s YesterDaze Vintage Clothing & Antiques at 5207 N. Florida Ave., in Seminole Heights at a discounted price. In the early 1900s, the land that is now Temple Terrace was acquired by renowned Chicago socialite Mrs. Bertha Honore’ Potter-Palmer (founder of Sarasota) as part of her exclusive 16,000-acre hunting preserve that she called “Riverhills Ranch”. Busch Gardens and USF were also originally part of this extensive preserve. The Woodmont Clubhouse in Temple Terrace is the last of Mrs. Potter-Palmer’s preserve buildings to survive, built in 1910. Mrs. Potter-Palmer’s vision for her property was that it be developed into a golf course community surrounded by extensive citrus groves but her death in 1918 prevented her from realizing that vision. At her death, trustee of her estate and brother Adrian Honore’ sold her local land holdings to Burks Hamner, Vance Helm, Maude Fowler (mother of Tampa Attorney Cody Fowler), and D. Collins Gillette. Mr. Honore’ retained a seat on the Board and fostered the realization of Mrs. Potter-Palmer’s citrus and golf course community vision. They formed two development corporations—Temple Terrace Estates, Inc., who developed the golf course and residential areas; and Temple Terraces, Inc., who developed 5,000 acres of orange groves that originally surrounded the City to the west and north, the largest orange grove in the world in the 1920s. Temple Terrace was also the first location in the United States that the new and expensive hybrid Temple orange was grown at scale. D. Collins Gillette oversaw Temple Terraces, Inc. and owned the first and largest citrus nursery in Florida, Buckeye Nurseries, and was also instrumental in bringing the Temple orange into the U.S. from Jamaica. The name “Temple Terrace” was derived from the Temple orange. “Terrace” referred in part to the rolling terrain of the area and in part from the terraces found in the yards of the first homes. Temple Terrace was designed as a golf course community targeted exclusively towards wealthy, retired Northerners. The concept was that each homeowner would live in a villa in the residential area during “The Season” (from the end of December to the annual Washington’s Ball held at the Country Club on February 22). Each homeowner would also have the option of owning a citrus grove tract in the community’s extensive citrus groves. 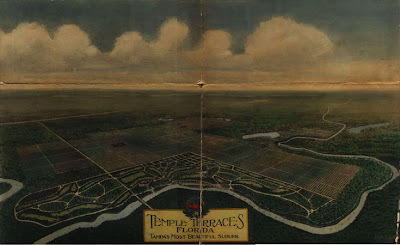 The new community was planned with a Mediterranean Revival theme; in fact Temple Terrace is one of the first planned golf course communities in the country (1921). Tampa architect M. Leo Elliott, who designed the original Clubhouse, the Club Morocco Casino, Real Estate office and the first ten houses. Locally, M. Leo designed Tampa’s Old City Hall and the Centro Asturiano. New York architect Dwight James Baum, who designed the remainder of the 1920s residences in Temple Terrace. Mr. Baum was the architect of the Ringling’s Ca d’ Zan mansion in Sarasota. The town planner who united the works of these masters was the foremost American planner of the 1920s, John Nolen, who also planned Sarasota and Venice, Florida. Construction occurred at a rapid pace from 1921 to 1926 but the vision of Temple Terrace’s founders was not to be entirely realized. The Depression came early to Florida and by the end of 1926 the Florida Boom was over. In 1927 Temple Terrace consisted of the golf course and residential areas laid out with about 85 Mediterranean Revival structures built, of which 70 still remain. The name sake of the town, the Temple orange grove, was largely wiped out in a hard freeze in the late 1920s and neglect claimed the rest. Temple Terrace struggled through the 1930s like the rest of Florida. Florida Bible Institute, now Florida College, a four year liberal arts college, bought the old Country Club Clubhouse and Club Morocco Casino in the late 1930s from the city for back taxes and both buildings remain part of the college. Billy Graham attended the college in the late 1930s and in his autobiography he writes he received his calling “on the 18th green of the Temple Terrace Golf and Country Club”. Building activity began to pick up again post World War II and we now have a fine collection of Mid-Century Modern homes and buildings, at least three having been designed by members of the renowned “Sarasota School”. The Temple Terrace Preservation Society will host a Historic Homes Tour featuring both Mediterranean Revival and Mid Century Modern homes on December 6, 2008; all preservation minded Bay area folks are invited to attend! If you have questions, photos or information on early Temple Terrace please contact Grant Rimbey, Temple Terrace Preservation Society, 411 Island Road, Temple Terrace, Florida, 813-914-9037, grimbey@ij.net. For more information on the home tour, please go to http://www.templeterracepreservation.com/ (please note that this website is under construction but will be up shortly).